What, what, what is gong on? ….oh ….what is that noise? ... wind storm? tornado? no, it is not outside the house. … what is shaking the bed? …what is making that noise? … explosion? …no it is still shaking …what is making that noise? Oh my god it must be an earthquake. The fireplace screens chatter against the fireplace glass doors, along with a rhythmic rattling in the chimney flue. Something is clanging in the bathroom. There is a very low base rumble as everything gently shakes. WOW an EARTHQUAKE in Atlanta. And then it was over. It is quiet. I am wide awake. All my internal systems alert and GO. The clock says 5:00AM. I am up and out of bed. WOW what just happened? …or did it really happen? Yes it must have been real since I am wide awake now. I know what I’ll do, I’ll turn on the radio, it must have been shaking down at the local radio station too. The 5:00AM news is on, no mention of anything unusual. Was it just our house? Did it really happen? As I go downstairs to the kitchen I look out the windows into the dark predawn morning; all visible houses have no lights on and I see no neighbors that would have also been awakened by the earthquake. If it woke me then it must have been strong enough to wake everyone! Did it really happen? I cannot go back to bed now. I make a pot of coffee and turn on the television. The 5:00AM news is on the air. They are reporting something about Iraq, a house fire and the death row inmate that is scheduled to meet a higher power in a week. Then, finally after several minutes, one of the talking heads nonchalantly says that there have been a few calls about the earth shaking. Then after a few more minutes that is ALL that they are talking about. Karen, the weather girl reports that she is from California and that this is old hat to her. She spouts off that the center of the quake was in Missouri, that it was a 4 point oh, everyone should know to stand in a doorway, and blah, blah, blah. Gosh she annoys me. And so the day began in Atlanta a little differently, with an earthquake. FORT PAYNE, Ala. - A rare Southern earthquake (news - web sites) rattled seven states early Tuesday, shaking people out of their sleep and cracking foundations but causing no major damage or injuries. Some people thought the boom and rumble was a bomb, a gas truck explosion, a tornado, even terrorism, but their fright soon gave way to nervous laughter. "The quake shook up the chicken shed so bad they all laid scrambled eggs," Jim Toler joked over breakfast at a restaurant. "It bounced us pretty heavy." 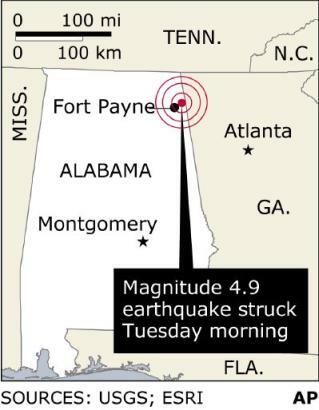 The magnitude 4.9 quake, tying the record for Alabama, struck around 4 a.m. and was centered near Fort Payne, close to the Georgia line, the U.S. Geological Survey (news - web sites) said. It was felt in parts of Alabama, Georgia, Tennessee, Kentucky, North Carolina, South Carolina and Mississippi. Residents said the earth moved for as long as a minute, including mild aftershocks that were described as being like a hard wind blowing against the side of the house. Many were surprised by the thundering noise that accompanied the vibrations. "My little boy thought the aliens were coming, and I thought it was a tornado," said waitress Tonya Wells. "For me, it seemed like it lasted forever. I woke up yelling 'Tornado! Tornado!'" Earthquakes (news - web sites) are uncommon in the Southeast, and few people in the area had experienced one before. "Everybody in the neighborhood was out on their front porch, all the dogs were barking, all the alarms were going off," said Ronnie Crow, a city electrical inspector. The dogs included Terry Camp's cocker spaniel named Elvis. "Elvis heard it coming," Camp said. "It scared me — I've never felt that sensation. It felt like something coming toward you, and then it made a big boom." The last earthquake reported in the region was on Dec. 8, 2001, with a magnitude of 3.9, said Butch Kinerney, a spokesman for the Geological Survey in Reston, Va. Southern Alabama had a magnitude 4.9 quake in 1997. Residents overloaded Fort Payne's 911 system with calls reporting broken dishes, cracked foundations, scattered power outages, crumbling chimneys and mud in their water. The Atlanta snowstorm has found a kindred spirit: the Atlanta earthquake. With both, lots of talk, no action. Certainly, real disasters have touched Atlanta. Sherman in 1864. Hurricane Opal in 1995. But "Earthquake 2003: Was That Aunt Martha Falling Out of Bed?" will hardly register as the cataclysm of an era. AOL Time Warner buys Atlanta Braves (2001). Aftershocks are felt all the way to Kevin Millwood's no-hitter in Philadelphia. New Coke (1985). Pepsi cheered, for a while. Then the North Avenue soda giant came to its senses. Rich's and Macy's leave downtown. What goes behind the Peachtree Plaza now? Your friendly, in-town Big Lots? Sartorial disasters await legions of downtown tourists. Pollen season (annually). Who can top a pollen count of 1,800? In Atlanta, it's not so much the heat that gets you, it's the hickory. Randy and Spiff get canned (February). A generation of parents and grandparents loses its oldies station. Now they wonder, "Who's Eminem?" Freaknik, NBA All-Star gridlock. Shoulder-to-shoulder, shopping wasn't fun.. What's a bigger disaster than that? Count your blessings. We're not in Nome, Alaska, which does snow and earthquakes much better than we do. Just in case, thank God we have all that Orange Alert duct tape on hand to hold everything together.